Saint John Eudes wrote many books and is best known today as the Apostle of the Sacred Heart of Jesus and the Immaculate Heart of Mary. In fact, he composed the Masses for those feast days. One of his most eloquent and powerful works is this treatise on baptism originally entitled, Le contrat de l’homme avec Dieu par le Saint Baptême. This translation was done in 1859 by Rev. J. M. Cullen and published in Philadelphia. Over 30,000 copies were quickly sold here in the USA. Other than spelling updating and some layout, citations, and punctuation changes, this 2012 edition is the same as Fr. Cullen’s edition of 1859. This treatise is one of the clearest and most lucid explanations of the essential nature of the sacrament ever composed. Due to his Jesuit training and his great sanctity, this saint is able to make such a clear and orderly presentation of the effects of this solemn contract between God and his children that it is hard to imagine anything better ever being written on the subject. St. John spent years with the Oratorians (founded by St. Philip Neri), and he was also the founder of two religious orders and an experienced missionary and preacher. He knew how to speak clearly and effectively to both Catholics and non-Catholics. Reading this compelling presentation of God’s great plan for us, elucidating the contract that we have entered into by our reception of the sacrament of baptism, and the responsibility that falls upon both God and ourselves for fulfilling our respective ends of that contract is a source of tremendous grace to the reader. 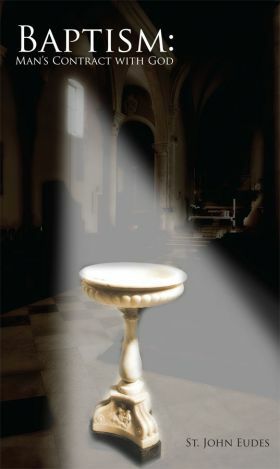 Although not intended as a catechism on baptism, it is strongly recommended that any teenager read it before confirmation and that any adult convert read it before their entrance into the church, as there is no better explanation we have ever seen of the practical (not theological) nature and effect of baptism. Upon reading this book you will come to a deeper understanding of why there can be no salvation outside of the Catholic Church and without sacramental baptism.